A hot trend this season is the romantic retro 1940s style. 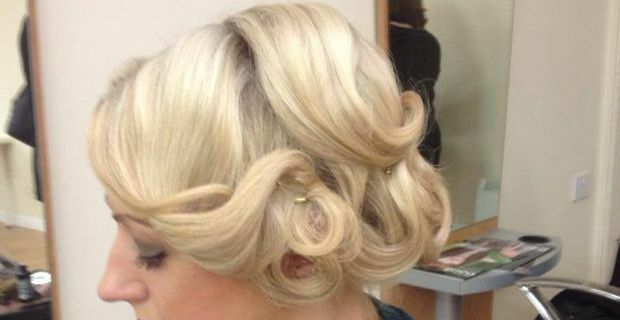 If you are after the look and you want to find out about easy 1940s hairstyles for everyday, this post is for you! The immortal great divas of the 1940s, like Ava Gadner, Rita Hayworth and Lana Turner will forever incarnate the femininity and strength of our grandmothers, and they can still teach contemporary women some lessons in style. The revival of the head scarf, the omnipresent fringe and the freshly revived pin up curls and victory rolls are no longer a prerogative of the rockabilly but have spread in the mainstream with enormous success. A-lists celebrities world wide are leading the way, gorgeous contemporary divas like Sienna Miller and Scarlett Johansson showing off heir retro hairdos on the red carpet. These hairstyles seem too perfect and opulent to copy, but the truth is that, on the contrary, many of these looks were created with the working women in mind: these were hairdos to wear during the daytime, for going to work or escape an air raid, industrial strength beauty for harsh times. A step by step hair tutorial for an easy 5 minute hairstyle, wearable for both daytime and evening. Realised by user Leanny Fury Singer, this is an easy to follow guide and the hairstyle is awesome, quintessentially retro. Better realised on washed hair. This ultrapopular tutorial is perfect for beginners, six hairstyles easily achievable. They require a little skill, but they are quick to do, with great results. Instant pin up look is guaranteed.